Viola Davis (born August 11, 1965) is an American actress and producer. She is the recipient of several awards, and is the first black actor to have won an Academy Award, an Emmy Award, and a Tony Award in acting, named the Triple Crown of Acting. Born in St. Matthews, South Carolina, Davis began her acting career, starring in minor theater productions. After graduating from the Juilliard School in 1993, she won an Obie Award in 1999 for her performance as Ruby McCollum in Everybody's Ruby. She played supporting and minor roles in several films and television series in the late 1990s and early 2000s, before winning the Tony Award for Best Featured Actress in a Play for her role as Tonya in August Wilson's King Hedley II in 2001. Davis's film breakthrough came in 2008, when her supporting role in the drama Doubt earned her a nomination for the Academy Award for Best Supporting Actress. This article is about the actress. For the Georgia politician, see Viola Davis (politician). For the nurse and Civil Rights activist, see Viola Davis Brown. St. Matthews, South Carolina, U.S.
Central Falls, Rhode Island, U.S.
Viola Davis (born August 11, 1965) is an American actress and producer. She is the recipient of several awards, and is the first black actor to have won an Academy Award, an Emmy Award, and a Tony Award in acting, named the Triple Crown of Acting. Born in St. Matthews, South Carolina, Davis began her acting career, starring in minor theater productions. After graduating from the Juilliard School in 1993, she won an Obie Award in 1999 for her performance as Ruby McCollum in Everybody's Ruby. She played supporting and minor roles in several films and television series in the late 1990s and early 2000s, before winning the Tony Award for Best Featured Actress in a Play for her role as Tonya in August Wilson's King Hedley II in 2001. Davis's film breakthrough came in 2008, when her supporting role in the drama Doubt earned her a nomination for the Academy Award for Best Supporting Actress. Greater success came to Davis in the 2010s; she won several accolades, beginning with the 2010 Tony Award for Best Actress in a Play for her role as Rose Maxson in the revival of August Wilson's play Fences. For her lead role as 1960s housemaid Aibileen Clark in the comedy-drama The Help (2011), Davis received a nomination for the Academy Award for Best Actress and won a SAG Award. In 2014, Davis began playing lawyer Annalise Keating in the ABC television drama series How to Get Away with Murder, and in 2015, she became the first black woman to win the Primetime Emmy Award for Outstanding Lead Actress in a Drama Series for her performance. In 2016, Davis played Amanda Waller in the superhero film Suicide Squad and reprised the role of Rose Maxson in the film adaptation of Fences, the latter of which earned her the Academy Award for Best Supporting Actress. In 2018, Davis starred as Veronica Rawlings in Steve McQueen's heist film Widows. Davis and her husband, Julius Tennon, are founders of the production company, JuVee Productions. Davis is also widely recognized for her advocacy and support of human rights and equal rights for women and women of color. She identifies as a feminist. In 2012 and 2017, she was listed by Time magazine as one of the 100 most influential people in the world. Davis was born on August 11, 1965, in St. Matthews, South Carolina, the daughter of Mary Alice (née Logan) and Dan Davis. She was born on her grandmother's farm in the Singleton Plantation. Her father was a horse trainer, and her mother was a maid, factory worker and homemaker. Two months after she was born, her family moved to Central Falls, Rhode Island, with Davis and two of her sisters, leaving her older sister and brother with her grandparents. Her mother was also an activist during the civil rights movement. At the age of two, Davis was taken to jail with her mother after she was arrested during a civil rights protest. She has described herself as having "lived in abject poverty and dysfunction" during her childhood, recalling living in "rat-infested and condemned" apartments. Davis is a cousin of actor Mike Colter, known for portraying the Marvel Comics character Luke Cage. Davis attended Central Falls High School, the alma mater to which she partially credits her love of stage acting with her involvement in the arts. As a teen, she was involved in the federal TRIO Upward Bound and TRIO Student Support Services programs. While enrolled at the Young People's School for the Performing Arts in West Warwick, Rhode Island, Davis's talent was recognized by a director at the program, Bernard Masterson. Following graduation from high school, Davis studied at Rhode Island College, majoring in theater and graduating in 1988. Next, she attended the Juilliard School for four years, and was a member of the school's Drama Division "Group 22" (1989–93). Davis received her Screen Actors Guild card in 1996 for doing one day of work, playing a nurse who passes a vial of blood to Timothy Hutton in the film The Substance of Fire. She was paid $528. In 2001, she won the Tony Award and a Drama Desk Award for her portrayal of Tonya in King Hedley II, a "35-year-old mother fighting eloquently for the right to abort a pregnancy." She won another Drama Desk Award for her work in a 2004 off-Broadway production of Intimate Apparel by Lynn Nottage. Davis appeared in numerous films, including three films directed by Steven Soderbergh, Out of Sight, Solaris and Traffic, as well as Syriana, which Soderbergh produced. Hers was the uncredited voice of the parole board interrogator who questions Danny Ocean (George Clooney) in the first scene in Ocean's Eleven. She also gave brief performances in the films Kate & Leopold and Antwone Fisher. She also played a secondary role in Far From Heaven, a 2002 film directed by Todd Haynes. Her television work includes a recurring role in Law & Order: Special Victims Unit, starring roles in two short-lived series, Traveler and Century City, and a special guest appearance in a Law & Order: Criminal Intent episode entitled "Badge". In 2008, Davis played Mrs. Mueller in the film adaptation to the Broadway play Doubt, with Meryl Streep, Philip Seymour Hoffman. Though Davis had only one scene in the film, she was nominated for several awards for her performance, including a Golden Globe and an Academy Award for Best Supporting Actress. On June 30, 2009, Davis was inducted into the Academy of Motion Picture Arts and Sciences. On June 13, 2010, Davis won her second Tony Award for her role as Rose Maxson in a revival of August Wilson's Fences. She was the second African-American woman to win the Tony for Best Performance by a Leading Actress in a Play, after Phylicia Rashad. Davis played the role of Dr. Minerva in It's Kind of a Funny Story (2010), a coming-of-age film written and directed by Anna Boden with Ryan Fleck, adapted from the 2006 novel by Ned Vizzini. In August 2011, Davis played the role of Aibileen Clark, a housemaid in 1960s Mississippi, in the screen adaptation of Kathryn Stockett's novel The Help, directed by Tate Taylor. Davis described her performance in the film as channeling her mother and grandmother saying, "I feel like I brought my mom to life; I've channeled her spirit. I channeled the spirit of my grandmother, and I've kind of paid homage to how they've contributed to my life and the lives of so many people". Davis was praised for her performance and eventually received two Screen Actors Guild Awards, as well as her second Academy Award nomination, which she ultimately lost to Meryl Streep. Davis received Golden Globe Award and BAFTA Award nominations for the same performance. In 2012, Time magazine listed Davis as one of the most influential people in the world. Also in 2012, Glamour magazine named Davis Glamour's Film Actress of the year. On June 12, 2012, Davis was presented with the Women in Film's Crystal Award by her friend and Oscar rival that year, Meryl Streep. On June 25, 2012, the Walk of Fame Committee of the Hollywood Chamber of Commerce announced that Davis was part of the new group of entertainment professionals who have been selected to receive stars on the Hollywood Walk of Fame in 2013. On January 5, 2017, Davis received the 2,597th star on the Walk of Fame. Davis reunited with The Help director Tate Taylor in Get on Up, a biopic of James Brown, playing Brown's mother. Her 3-year-old daughter, Genesis also appeared in the movie. In February 2014, Davis was cast in Peter Nowalk's pilot How to Get Away with Murder (executive produced by Shonda Rhimes for her ShondaLand production company) as the lead character. Her character, Annalise Keating, is a tough criminal defense attorney and professor who becomes entangled in murder plot with her students. It began as a series in September 2014. On September 20, 2015, Davis became the first black woman of any nationality to win the Primetime Emmy Award for Outstanding Lead Actress in a Drama Series for her lead role on How to Get Away with Murder. She received a second Primetime Emmy Award nomination for the role in 2016. Davis also won two Screen Actors Guild Awards for Outstanding Performance by a Female Actor in a Drama Series in 2014 and 2015. She received nominations from the Golden Globe Awards for Best Actress – Television Series Drama and Critics' Choice Award for Best Actress in a Drama Series for her performance on the show. In 2015, Davis appeared in Blackhat, a Michael Mann-directed thriller film starring Chris Hemsworth. Davis also served as executive-producer of the crime drama film Lila & Eve, starring herself and Jennifer Lopez in the titular roles. In 2016, Davis starred in the courtroom drama Custody, on which she also served as an executive producer, and played Amanda Waller in the film Suicide Squad, an adaptation of a DC Comics series of the same name. Davis reprised her role as Rose Maxson for the film adaptation of Fences, for which she received her third Academy Award nomination, making her the first black actress in history to achieve this feat. She subsequently went on to win the Academy Award for Best Supporting Actress, the Golden Globe Award for Best Supporting Actress, the Screen Actors Guild Award for Outstanding Performance by a Female Actor in a Supporting Role, and the BAFTA Award for Best Actress in a Supporting Role. On January 6, 2017, Davis was presented with the 2,597th star on the Hollywood Walk of Fame by her Doubt co-star and friend Meryl Streep. While accepting the honor, Davis said that she could not believe her life: "It's like my life flashing before my eyes, and all I can say is, God has blessed my life in abundance." Davis was also listed among and a featured cover star of Time Magazine's "100 Most Influential People" List for the second time, her first being in 2012. Streep penned the article in the magazine, referring to Davis as having "carved a place for herself on the Mount Rushmore of the 21st century", commenting that "her gifts as an artist are unassailable, undeniable, deep and rich and true. But her importance in the culture — her ability to identify it, her willingness to speak about it and take on responsibility for it — is what marks her for greatness." On January 30, it was announced that Davis would star alongside Julia Roberts in the film adaptation of Jodi Picoult's novel, Small Great Things. On March 4, Davis was awarded the Artist of the Year Award at Harvard University. In 2018, Davis starred in the Steve McQueen–directed heist thriller Widows, an adaptation of the popular 1983 British miniseries. On January 22, Davis debuted Two-Sides, a documentary series exploring police brutality towards the African-American community. The series debuted on TV One, running through till mid-February. Davis also starred alongside fellow Shondaland costar Kerry Washington for a special two-hour crossover episode of How to Get Away with Murder and Scandal, aptly titled How to Get Away with Scandal. Davis's guest appearance garnered her a fourth Emmy Award nomination, and her first for Outstanding Guest Actress in a Drama Series. On March 1, Davis announced that she would star alongside Lupita Nyong'o in The Woman King, inspired by true events that took place within The Kingdom of Dahomey. The film will tell the story of Nanisca, the general of an all-female military unit, played by Davis, and her daughter Nawi, played by Nyong'o. On October 10, 2017, Davis announced that she would write the sequel to the classic picture book Corduroy, titled Corduroy Takes a Bow. In a press release, Davis stated that "Corduroy has always held a special place in my life, first as a child paging through it, and then again with my daughter, introducing her to the adventures of that adorable teddy bear". On March 13, 2018, Davis shared the cover of the book on her Twitter page. The book was published by Penguin/Random House on September 4, 2018. In 2011, Davis donated funds to her hometown public library in Central Falls, Rhode Island, to assist in preventing its closure due to a lack of city funding. In 2018, Davis donated funds to her alma mater, Central Falls High School, for its theater program. As part of her partnership with Vaseline to promote the Vaseline Healing Project, Davis attended the groundbreaking of a free community health center in Central Falls, Rhode Island in October 2016 that was sponsored by the project. The project provides dermatological care to help heal the skin of those affected by poverty around the world. Since 2014, Davis has collaborated with the Hunger Is campaign to help eradicate childhood hunger across America. Speaking on her work, Davis said that "seventeen million kids in this country, so one in five kids in this country, go to bed hungry. I was one of those kids, because I grew up in abject poverty; I did everything that you could possibly imagine to get food: I rummaged in the garbage cans, I stole from the local store constantly." As an honoree at the 2014 Variety Power of Women luncheon, Davis further commented that "the thing that made me join...was the word 'eradicate', 'get rid of' - not by thirty-percent not by twenty-percent not by fifty-percent, but to do away [with it]. Because everyone should be a child, and should grow up and have a chance at the American dream". In September, 2017, Davis kick-started the $30K in 30 Days Project with Hunger Is, awarding a $1,000 grant to the Rhode Island Community food bank in her home state. Davis married actor Julius Tennon in June 2003. In 2011, Davis and her husband adopted an infant daughter. Davis is stepmother to Tennon's son and daughter from previous relationships. Davis is a Christian and regularly attends services at Oasis Church in Los Angeles. According to Rotten Tomatoes and The Numbers, Davis's most commercially successful and critically acclaimed films include Traffic (2000), Doubt (2008), Law Abiding Citizen (2009), Knight and Day and Eat Pray Love (2010); The Help (2011), Suicide Squad and Fences (2016). Throughout her career, Davis is a recipient of many films, critics and societies awards. For her stage work, she has won two Tony Awards, three Drama Desk Awards, a Obie Award and Theater World Award. She holds the distinction of becoming the first and only actress of color to win a Primetime Emmy Award for Outstanding Lead Actress in a Drama Series and is the first African-American to win five Screen Actors Guild Awards. She has been nominated for four Golden Globes Awards, two British Academy Film Awards winning one for each and by earning the Academy Award for Best Supporting Actress honor for Fences, Davis became the first black actor to achieve the Triple Crown of Acting: winning a competitive Oscar, Emmy and Tony in acting categories. She is one of only two black actresses (the other being Octavia Spencer) to have received three Academy Award nominations. Davis was awarded an honorary doctorate in Fine Arts from her undergraduate alma mater, Rhode Island College, in 2002. ↑ "Viola Davis Biography: Theater Actress, Film Actress, Television Actress". Biography.com. Archived from the original on December 22, 2014. Retrieved September 21, 2015. 1 2 "The 100 Most Influential People In The World: Viola Davis". Time. Archived from the original on April 20, 2017. Retrieved April 21, 2017. 1 2 3 "The 100 Most Influential People In The World". Time. April 18, 2012. Archived from the original on April 22, 2012. ↑ Boroff, Philip (June 14, 2010). "Denzel Washington, Viola Davis, 'Memphis,' Win Top Tony Awards". Bloomberg L.P. Archived from the original on May 7, 2013. Retrieved July 8, 2012. ↑ SAG Awards 2012: Complete list of winners Archived February 1, 2012, at the Wayback Machine The Associated Press via New York Daily News, January 30, 2012. ↑ "Emmy Awards 2015: The complete winners list". CNN. September 21, 2015. Archived from the original on September 22, 2015. ↑ "Viola Davis announces 'Fences' wrap: let the Oscar campaigns begin". Serving Cinema. June 14, 2016. Archived from the original on January 10, 2017. Retrieved January 9, 2017. ↑ "Viola Davis Wins First Golden Globe for 'Fences'". Variety. January 8, 2017. Archived from the original on January 9, 2017. Retrieved January 20, 2018. ↑ "Critics Choice Awards 2016: Viola Davis wins best supporting actress". Entertainment Weekly. December 12, 2016. Archived from the original on January 10, 2017. Retrieved January 9, 2017. ↑ "Viola Davis Gave The Most Powerful Speech At The Women's March On Intersectional Feminism". Retrieved 2018-02-24. ↑ "Viola Davis Talks Growing Up Hungry, Poor and Ashamed". Blackenterprise.com. August 4, 2015. Archived from the original on October 30, 2016. Retrieved January 24, 2017. ↑ "Viola Davis' path from poverty in Central Falls to Hollywood glamour" Archived February 27, 2009, at the Wayback Machine Providence Journal, February 22, 2009. ↑ "Veteran Actors, First Time Nominees". The Wall Street Journal. February 20, 2009. Archived from the original on November 9, 2012. 1 2 Buckley, Michael (March 14, 2004). "Chats with Intimate Apparel's Viola Davis and New York Newcomer, King Lear's Geraint Wyn Davies". Playbill. Archived from the original on December 15, 2008. Retrieved July 14, 2013. ↑ "Viola Davis: "The Help" and "Daring Yourself to Dream Big" Archived October 4, 2011, at the Wayback Machine, Life Goes Strong, August 1, 2011. ↑ "Viola Davis Tackles Fear, Shines In 'Doubt'", NPR, December 10, 2008. ↑ Gonzales, Erica (February 27, 2017). "Viola Davis Grew Up in Poverty and Rat-Infested Apartments—Now She Has an Oscar". Harper's Bazaar. Archived from the original on February 28, 2017. Retrieved February 27, 2017. ↑ Sharma, Nemisha (December 6, 2015). "'Luke Cage': 5 Cool Things You Didn't Know About Marvel/Netflix Star Mike Colter". Design & Trend. Archived from the original on July 27, 2016. Retrieved July 16, 2016. ↑ "Viola Davis". The A.V. Club. Archived from the original on January 10, 2010. ↑ "Viola Davis". TV Guide. Archived from the original on November 23, 2010. ↑ Brown, Gita, "Exclusive What’s News @ RIC interview: Viola Davis talks about her life and her new film", What's News, ric.edu, August 2, 2011. ↑ "Alumni News". Juilliard School. October 2011. Archived from the original on November 11, 2011. ↑ Moynihan, Rob (January 19, 2015). "How I Got My SAG-AFTRA Card", TV Guide, p. 8. ↑ "Truly, Madly, Intimately" Archived August 28, 2008, at the Wayback Machine, American Theatre magazine, September 2004. ↑ Stodghill, Alexis Garrett (December 23, 2011). "Viola Davis' top 10 performances: From 'Traffic' to 'The Help'". Grio. Archived from the original on July 5, 2012. Retrieved July 8, 2012. ↑ Caro, Mark (February 14, 2009). "Viola Davis: The Pop Machine interview". Chicago Tribune. Archived from the original on October 18, 2015. Retrieved September 21, 2015. ↑ "Oscar nominations 2009: Amy Adams and Viola Davis discuss their roles in Doubt". The Daily Telegraph. January 22, 2009. Archived from the original on January 3, 2015. Retrieved July 8, 2012. ↑ "Academy Invites 134 to Membership". Academy of Motion Picture Arts and Sciences. June 30, 2009. Archived from the original on May 18, 2012. Retrieved July 8, 2012. ↑ "Fences Stars Viola Davis & Denzel Washington Win 2010 Tony Awards". broadway.com. June 13, 2010. Archived from the original on August 21, 2012. Retrieved July 8, 2012. ↑ Sciretta, Peter (November 30, 2009). "Ryan Fleck's It's Kind of a Funny Story Begins Production". /Film. Archived from the original on June 12, 2010. Retrieved June 12, 2010. 1 2 "Viola Davis On 'The Help': 'I've Brought My Mom To Life'". HuffPost. August 11, 2011. Archived from the original on April 3, 2017. Retrieved April 2, 2017. ↑ Eggertsen, Chris (September 14, 2014). "Shocker: Oscar nominee Viola Davis is routinely offered 'mammy-ish' roles by Hollywood" Archived January 28, 2015, at the Wayback Machine. HitFix. ↑ "Viola Davis". Golden Globes. Retrieved 16 March 2018. ↑ "Viola Davis". BAFTA Awards database. Retrieved 16 March 2018. ↑ "TIME '100 Most Influential People': Kristen Wiig, Viola Davis And Other Actors Honored". moviefone. April 18, 2012. Archived from the original on April 22, 2012. Retrieved July 8, 2012. ↑ "Film Actress – Viola Davis". glamourmagazine. May 29, 2012. Archived from the original on June 21, 2012. Retrieved July 8, 2012. ↑ "Meryl Streep-Viola Davis Love Fest at Women in Film Awards". showbiz. June 14, 2012. Archived from the original on June 18, 2012. Retrieved July 8, 2012. ↑ Gans, Andrew (June 25, 2012). "Viola Davis, Helen Mirren, Jane Lynch, Olympia Dukakis, Jennifer Hudson Are Hollywood Walk of Fame Recipients". Archived from the original on January 31, 2013. Retrieved July 8, 2012. ↑ Gettell, Oliver (January 5, 2017). "Viola Davis accepts star on Walk of Fame: 'I cannot believe my life'". Archived from the original on January 7, 2017. Retrieved January 20, 2018. ↑ "Tate Taylor Reunites With 'The Help's' Viola Davis, Octavia Spencer On James Brown Pic". Deadline. September 30, 2013. Archived from the original on October 24, 2013. Retrieved October 23, 2013. ↑ "Viola Davis – Viola Davis' Daughter To Make Acting Debut In James Brown Biopic". WENN. October 22, 2013. Archived from the original on October 29, 2013. Retrieved October 23, 2013. ↑ "Viola Davis to Star in ABC Drama 'How to Get Away With Murder'". The Hollywood Reporter. Archived from the original on May 21, 2014. Retrieved May 10, 2014. ↑ "Sneak Peek! See Viola Davis in Her New Drama How to Get Away With Murder". Us Weekly. Archived from the original on April 2, 2017. Retrieved April 1, 2017. ↑ "ABC Orders 'How to Get Away With Murder', 'Black-ish,' 'American Crime', 'Selfie', 'Galavant', More to Series". The Hollywood Reporter. Archived from the original on May 9, 2014. Retrieved April 2, 2017. ↑ "Viola Davis On 'How to Get Away with Murder'". Biography. Archived from the original on August 3, 2016. Retrieved April 2, 2017. ↑ Andreeva, Nellie (May 8, 2014). "ABC Picks Up Shonda Rhimes 'How To Get Away With Murder', John Ridley's 'American Crime', Comedy 'Black-ish' To Series". Deadline Hollywood. Archived from the original on May 9, 2014. Retrieved May 9, 2014. ↑ Nakamura, Reid. "Viola Davis and Taraji P. Henson Make Emmy History With 'How to Get Away With Murder', 'Empire' Roles". Archived from the original on September 5, 2015. Retrieved August 27, 2015. ↑ Michael Gold. Viola Davis’s Emmy Speech Archived February 28, 2017, at the Wayback Machine. Awards Season. The 2015 Emmy Awards. New York Times, September 20, 2015. Retrieved September 28, 2015. ↑ Stephanie Merry, "Emmy Awards: ‘Game of Thrones’ beats ‘Mad Men’, Viola Davis becomes first African American to win best actress in drama, Jon Hamm finally wins best actor, ‘Veep’ sweeps" Archived September 28, 2015, at the Wayback Machine, Washington Post, September 20, 2015. Retrieved September 28, 2015. ↑ "Emmy Nominations 2016: Game of Thrones Rules Again". The New York Times. July 7, 2016. Archived from the original on July 17, 2016. Retrieved July 20, 2016. 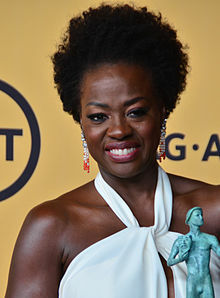 ↑ "Viola Davis SAG Award for Best Actress in a TV Drama". E!. Archived from the original on April 3, 2017. Retrieved April 2, 2017. ↑ "Viola Davis Nominated for Golden Globe, SAG & NAACP Awards | How to Get Away with Murder". ABC. Archived from the original on April 3, 2017. Retrieved April 2, 2017. ↑ "Viola Davis In Talks To Star In Michael Mann's Cyber Crime Pic". Deadline. April 19, 2013. Archived from the original on May 27, 2013. Retrieved July 5, 2013. ↑ Debruge, Peter (January 31, 2015). "Sundance Film Review: 'Lila and Eve'". Variety. Retrieved March 4, 2018. ↑ McNary, Dave (April 30, 2015). "Hayden Panettiere, Ellen Burstyn Join Viola Davis in 'Custody'". Variety. Archived from the original on May 18, 2015. Retrieved May 15, 2015. ↑ "EXCLUSIVE: Viola Davis Bags Amanda Waller Role In 'Suicide Squad'". Latino-Review.com. December 16, 2014. Archived from the original on December 17, 2014. ↑ Willis, Jackie (January 24, 2017). "VViola Davis Becomes First Black Actress to Earn 3 Oscar Nominations". Entertainment Tonight. Retrieved March 4, 2018. ↑ Workneh, Lilly (January 30, 2017). "Viola Davis Wins SAG Award, Thanks 'Fences' Author For Elevating Black Narrative". Huffington Post. Retrieved March 4, 2018. ↑ Tristram Fane Saunders (February 13, 2017). "Bafta winners 2017, full list: victory for La La Land and I, Daniel Blake". The Daily Telegraph. Archived from the original on February 15, 2017. Retrieved February 27, 2017. ↑ Easter, Makeda (January 6, 2017). "'I cannot believe my life right now': Viola Davis gets her star on the Walk of Fame". Los Angeles Times. Retrieved March 4, 2018. ↑ Schnurr, Samantha (April 20, 2017). "Viola Davis, John Legend, Riz Ahmed and More Stars Land Covers for Time's 100 Most Influential People of 2017". E!. Retrieved March 4, 2018. ↑ Delbyck, Cole (April 20, 2017). "Viola Davis, James Corden And Emma Stone Make Time's 100 Most Influential People List". Huffington Post. Retrieved March 4, 2018. ↑ McNary, Dave (January 30, 2017). "Viola Davis, Julia Roberts to Star in Drama 'Small Great Things'". Variety. Retrieved March 4, 2018. ↑ Bonn, Tess (March 6, 2017). "See Viola Davis' Powerful Harvard Award Acceptance Speech". Rolling Stone. Retrieved March 4, 2018. ↑ M Smith, Nigel (September 26, 2016). "Viola Davis to star in Steve McQueen's heist thriller Widows". The Guardian. Retrieved March 4, 2018. ↑ Muhammad, Latifah (January 28, 2018). "'Two Sides': Viola Davis Debuts Documentary Series On Police Brutality". Vibe. Retrieved March 4, 2018. ↑ "Performer of the Week: Viola Davis". TV Line. March 3, 2018. Retrieved March 4, 2018. ↑ Kroll, Justin (March 1, 2018). "TriStar Acquires 'The Woman King' Starring Viola Davis and Lupita Nyong'o". Variety. Retrieved March 4, 2018. ↑ Hipes, Patrick (March 1, 2018). "'The Woman King' Starring Viola Davis & Lupita Nyong'o Lives To Fight At TriStar". Deadline. Retrieved March 4, 2018. ↑ Lee, Jarry (October 10, 2017). "Viola Davis Is Writing A Sequel To Classic Picture Book "Corduroy"". Buzzfeed. Retrieved March 4, 2018. ↑ Gillette, Sam (March 14, 2018). "Viola Davis Writes Sequel to Kids' Classic Corduroy: How African-American Character Inspired Her". People. Retrieved March 13, 2018. ↑ "The Help! Viola Davis Donates Money To Library In Hometown". NewsOne. November 22, 2011. Retrieved March 5, 2018. ↑ "Viola Davis donates to CF High theater program". American News. January 31, 2018. Retrieved March 5, 2018. 1 2 Arditi, Lynn (October 8, 2016). "Viola Davis returns to hometown for Central Falls health center groundbreaking". The Providence Journal. Archived from the original on January 13, 2017. Retrieved January 12, 2017. Davis has been one of the city's most high-profile boosters, raising and donating money for the city's Adams Memorial Library, the Central Falls High School chess team and drama club, and the Segue Institute for Learning, a charter school. ↑ Finney, Ali (October 20, 2016). "Viola Davis on What It Means to Be Your Authentic Self". Women's Health. Retrieved March 4, 2018. ↑ Lee, Lauren (October 28, 2016). "Viola Davis takes on poverty in hometown". CNN. Retrieved March 5, 2018. 1 2 Lambe, Stacy (October 5, 2017). "Viola Davis Partners With Hunger Is Foundation to Deliver 30 Grants in 30 Days (Exclusive)". Entertainment Tonight. Retrieved March 4, 2018. ↑ Johnson, Zach (July 29, 2015). "Viola Davis Poses With Daughter Genesis Tennon for AARP the Magazine and Reflects on Her Life Before Turning 50". E!. Archived from the original on September 21, 2015. Retrieved September 21, 2015. ↑ Nahas, Aili; Raftery, Elizabeth (October 18, 2011). "Viola Davis Adopts a Daughter, Genesis". People. Archived from the original on October 14, 2014. Retrieved September 21, 2015. ↑ Marikar, Sheila (December 12, 2015). "Los Angeles Churches Make Worship...Hip?". Archived from the original on May 18, 2016 – via NYTimes.com. ↑ "Oscars 2017 updates: What really happened backstage at the Academy Awards". Archived from the original on March 10, 2017 – via LA Times. ↑ "Viola Davis - Box Office". The Numbers. Retrieved 2018-05-26. ↑ "Viola Davis". www.rottentomatoes.com. Retrieved 2018-05-26. ↑ Karen Mizoguchi. "SAG Awards 2017: Viola Davis Becomes First African American Actress to Score 5 Wins". People. Archived from the original on January 30, 2017. Retrieved February 1, 2017. ↑ Zak, Dan. "Only 22 people had ever accomplished this feat. Now, Viola Davis joins the club". The Washington Post. Archived from the original on March 1, 2017. Retrieved March 1, 2017. ↑ Nolfi, Joey (2018-01-23). "Oscars: Octavia Spencer makes history with The Shape of Water nomination". Entertainment Weekly. Retrieved 2018-01-23. ↑ RIC to Award 1,300 Degrees at Commencement Exercises Archived November 16, 2006, at the Wayback Machine, from the website of Rhode Island College. Wikimedia Commons has media related to Viola Davis.